The first movie ever made, an 1877 experiment by Eadweard Muybridge, was about horses. And when the movies reached maturity, around the turn of the century, the genre that quickly established itself as the most popular and durable was the Western—a genre that many critics would describe (and not without some truth) as still primarily about horses. There seems to be a fundamental affinity between the movie mechanism and the speed, grace, and force of equine movement. The spectacle of a horse in flight seems to tap the essence of film: the ability to apprehend and poeticize movement on a scale much larger and grander than that available to the proscenium-bound arts of dance and theater. There is a moment in Carroll Ballard’s The Black Stallion when the camera goes underwater to capture the title creature in the uncharacteristic act of swimming. As the horse’s hooves pierce and divide the water, as the legs jut down and drift slowly back for the next thrust, one has the sensation of seeing the animal function truly—and beautifully—for the first time. It must be the same sensation that Muybridge’s primitive film produced: in the slowed motion of cinema, an everyday occurrence is transformed and aestheticized; the movement we take for granted becomes something rich and strange. Ballard’s film (it is his first feature) is about just such transformations—the transformations of film worked not only on horses but on people and places, and even on mud puddles and cigarette smoke. Ballard has selected a subject that cuts to the primal appeal of movies, and he has selected a style that draws on only the most elemental components of film: sound, image, rhythm. His story, taken from a children’s novel by Walter Farley, has been barely dramatized. His characters, deliberately, are generalized and vague, and he seems to have enforced a quiet, hesitant style on his players that is barely perceptible as “acting.” Instead, he concentrates on the physicality of the filmed moment, on the shades of light, the touch of objects and animals, the sound of wind and rain and fire. Ballard has chosen the most dangerous and contradictory of artistic approaches, that of the self-conscious primitive. He must convince us of the utter simplicity and freshness of everything he does, and he does everything through the most sophisticated technology of New Hollywood filmmaking. That Ballard largely succeeds in making us forget the batteries of lights, the recording equipment, and the long hours of editing needed to produce the impression of spontaneity, of seeing things for the first time, is the surest testament to his talent. At its best, The Black Stallion manages one of the most difficult artistic feats—it rediscovers reality, finding a world apart within our world. By shooting the horse in sections—a head, a back, or a leg will fill the screen—Ballard gives us the pieces of a mythic puzzle, to be assembled, in our own imaginations, into something larger than life. The film begins in a burst of exoticism, placing the audience in the middle of the Mediterranean circa 1947, on board a steamship populated by character types—gamblers, traders, inscrutable Orientals—who could have stepped out of a Warner Brothers spy thriller. A group of men play poker in a smoky, darkened lounge; a middle-aged American in a loud Hawaiian shirt is winning. Meanwhile, his son (Kelly Reno) explores the corridors of the ship. A muffled whinny, the stirrings of some large body, comes from one compartment. The boy approaches cautiously; his offer of a lump of sugar is accepted by a black snout that pushes through a porthole and then disappears. The black stallion’s presence never becomes much more concrete—Ballard’s visual style allows it to remain an ideal, a principle of force and speed beyond complete comprehension. By shooting the horse in sections—a head, a back, or a leg will fill the screen—Ballard gives us the pieces of a mythic puzzle, to be assembled, in our own imaginations, into something larger than life. Ballard suggests the whole by its parts: parts that can be photographed, and a whole—because it exists beyond the grasp of the literal image—that can’t. 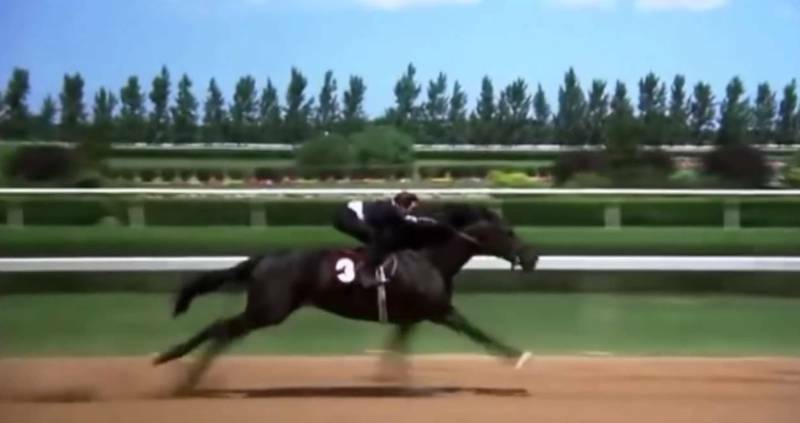 When the horse is seen full figure, the shots are carefully backlighted, turning the animal into a jet-black figure against a bright color field. He seems to tear a hole in the screen: stripped of detail and dimension by the backlight, the horse is both there and not there. As a rule, animal pictures try to humanize their subjects, giving the Lassies and Flickas and Rin Tin Tins a range of emotions—love and loyalty, courage and compassion—that would challenge Sir Laurence Olivier. Ballard, instead, has chosen to abstract his stallion. The horse emerges with the pure form of a Brancusi sculpture, above sentiment and cuddlesomeness. There’s something threatening, almost supernatural in its figure, as if the horse were an emissary from another level of existence where primal forces run free. The element of danger gives a keen, exhilarating edge to what might have been the most conventionally cute sequence in the film, in which the boy and the horse find each other on a deserted island after their ship has sunk in a storm. It’s an Edenic setting, dripping with greenery and ribboned by white sand. But although Ballard is sometimes guilty of arranging his shots for pure pictorial effect, the sequence never degenerates into mere prettiness. The boy and the horse approach each other with a degree of suspicion; some testing and thinking has to go on before they become friends. And when the tension between them is finally resolved—the boy mounts the horse for a wild ride along the surf—there is no sense of the horse’s having been conquered or domesticated. Instead, they seem to reach an understanding based on mutual regard. The horse has condescended to meet the boy; their relationship is privileged, unique. There’s no better film around right now to introduce young children to the imaginative power of movies: for a child who knows only the flat talking-heads style of television, the depth and expansiveness of The Black Stallion could open up a whole new world. And then Ballard does an amazing thing. With a quick cut, the action moves back to America—to the medium-sized Midwestern town that is the boy’s home. (These scenes were actually filmed in Toronto.) The boy has been rescued; the stallion has come back with him. Yet, even in the abrupt shift from desert-island exoticism to gray urban reality, the aura of privileged feeling continues to glow. It’s one thing to whip up a sense of lyrical intensity in the middle of the Mediterranean; it’s something else—and much more difficult—to find the same feelings in familiar, prosaic surroundings. But Ballard does, and brilliantly, again using the horse as an agent of magical transformation. Pent up in the backyard of a modest tract house, the stallion dominates and redeems his environment. When the horse takes off, galloping down a tree-lined street, he seems to carry his power with him: the rows of houses and the factories and waste lots and fields all seem newly beautiful as he dashes by them. The horse leads the boy to a small farm owned by an aging trainer (Mickey Rooney, whose role is a resonant expansion of his part in National Velvet). There, a secret society forms around the stallion—Rooney and the boy are joined by a black junkman (Clarence Muse) and the night watchman of the local racetrack (Ed McNamara) as they prepare the horse for competition. There are a few missteps here: clichés of action and character that haven’t been sufficiently reworked, some fake newsreel footage that borders on the cornball. But even the film’s most artificial character—a racetrack reporter with a campy delivery and an absurdly large retinue—is redeemed when he provides the premise for one of the film’s most elegantly wrought visual effects: a midnight test run in the rain, with horse and rider illuminated by a ring of limousine headlights. The Black Stallion is, above all, a sensory experience. Ballard doesn’t deal in ideas, and he seldom stops long enough to examine the emotions that he’s conjured. He doesn’t analyze or offer perspectives: instead, his involvement with his material seems almost epicurean; he takes a voluptuous pleasure in textures and colors, gestures and rhythms. Caleb Deschanel, his cinematographer, offers the perfect complement to Ballard’s sensibility, drawing warm, burnished tones and delicate shades of light while keeping his images in prickly sharp focus. It’s a movie that makes you want to reach out and touch. The Black Stallion is a perfect movie for families. Its elemental appeal cuts across age lines—anyone can honestly enjoy its layered sounds and rich, seductive images. There’s no better film around right now to introduce young children to the imaginative power of movies: for a child who knows only the flat talking-heads style of television, the depth and expansiveness of The Black Stallion could open up a whole new world. And it may well do the same for many adults. Reprinted with permission from Movies That Mattered by Dave Kehr. Published by the University of Chicago Press. © 2017 Dave Kehr. All rights reserved.